It is my pleasure to introduce you to Dalat Golf Club, rated as Vietnam’s leading golf course and, proudly, it’s only bent grass green. Dalat Golf Club is the most highly awarded course in this inspired country and has attracted a full spectrum of international golfing enthusiasts. Measuring 7,009 yards from the tips, the course is an uninterrupted string of inventive, demanding golf holes. 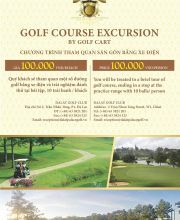 We look forward to teeing off with you soon at Dalat Golf Club.